There may be times when you need some immediate advice to help you with minor illnesses that you may be able to treat yourself. This information has been put together by clinicians at the Friarsgate Practice as a guide to help you treat minor illnesses or conditions that you or your family may be suffering. The advice indicates when self-treatment is appropriate and when you should seek urgent help. A cold is an infection of the nose and upper airways caused by a virus. Symptoms usually peak after two to three days and then gradually wear off, usually lasting about a week. The cough may last for an average of three weeks. Take regular paracetamol or ibuprofen - please read the product information for dosages or speak to your local chemist. Cystitis is a common problem that is caused by infection or irritation to the bladder. Mild symptoms will often settle within 4-9 days. All children, and men with cystitis symptoms, need to consult with their GP. Women may not need antibiotics and symptoms can settle with increasing fluid intake and taking simple painkillers. If you are passing blood in your urine, you will need to drop a urine sample off at the practice for testing. If symptoms are severe, or you develop backache or fever, then you may need to consult with your GP. Antibiotics can sometimes be prescribed following a telephone consultation with your GP or minor aliments nurse. Ear infection is common in children, but can occur at any age. The main symptoms are earache and feeling unwell. Painkillers are the main treatment. Your child may complain of earache following a cold and they may have an ear infection. This is because fluid in the middle ear develops after the cold and the eardrum may become inflamed. These are common and generally get better without the need for antibiotics. We would advise treating the pain with painkillers such as paracetamol or ibuprofen and seeing how they go for 48 hrs - please read the product information for dosages or speak to your local chemist. Ear drops alone will clear a plug of earwax in most cases. You can buy drops from pharmacies. Put 2 or 3 drops of ordinary olive oil down the ear 2 or 3 times a day for 3 weeks. This softens the wax so that it then runs out of its own accord without harming the ear. You can continue for any length of time, but 3 weeks is usually enough. Surprisingly, you will not necessarily see wax come out. It often seems to come out unnoticed. If, after 3 weeks or more, you are still deaf from wax, you will need to make an appointment with a doctor or nurse to decide what should be done. Warm the drops to room temperature before using them. Pour a few drops into the affected ear. Lie with the affected ear uppermost when putting in drops. Stay like this for 10 minutes to allow the drops to soak into the earwax. Bulb syringing is a safe, alternate way to remove ear wax. Bulb syringes can be easily purchased from the chemist and allow you to clear your ears from wax in your own home. Use olive oil drops twice a day for at least 14 days prior to bulb syringing. Always use a clean syringe. Fill the syringe with cooled, boiled water that is warm to the touch. Do NOT use hot water. Place the tip of the syringe into the opening of the ear. - Do NOT push the syringe further into the ear. Squeeze the syringe firmly but gently to insert a small amount of water into the ear. Keep your head in this position for 5 to 15 minutes then let it run out. Fever is a common symptom in both children and adults. You have a fever if your body temperature is greater than 38°c (or higher than 37.5°c when less than five years old). Most fevers are due to viral illnesses such as coughs and colds and do not last long. Fever helps your body fight infections by making it harder for the bacteria and viruses that cause infections to survive. Gastroenteritis is an infection of the gut and can cause diarrhoea, vomiting, abdominal cramps and fever. In children, who are healthy, the infection will run its natural course and will be cured by natural body defences. Vomiting usually lasts two to three days and diarrhoea lasts five to seven days. The main risk is dehydration and the most important treatment is to replace the fluid lost and give enough fluid to keep up with on going losses. Rotavirus is the most common virus causing gastroenteritis in children in the UK. Adenoviruses are another group of viruses that cause gastroenteritis in children. They are usually spread by close contact. It is very important to wash your hands with warm soapy water after changing nappies and before preparing, serving or eating food, to prevent spread. Child should stay off school until 48 hours after last diarrhoea and no swimming until two weeks after last diarrhoea. Acute sinusitis usually develops after a common cold causing a viral sinus infection. Symptoms usually peak after two to three days and last about a week. However, symptoms can persist for two to three weeks – this can sometimes indicate a bacterial infection. Coloured nasal discharge does not necessarily mean you need antibiotics. Most cases of acute sinusitis are due to a viral infection and, therefore, antibiotics will not help. A sore throat is very common and is usually caused by a virus. It will normally get better without needing specific treatment or antibiotics. Lyme disease is an illness caused by bacteria that live in the gut of some ticks. The bacteria can be passed to humans if an infected tick bites them. Lyme disease is relatively uncommon in the UK but the risk varies according to location within the country. Risk is highest in rural forested areas such as the New Forest, Exmoor, Lake District and the Scottish Highlands. Ticks are small insect-like creatures that attach themselves to passing animals and people by biting through skin and sucking blood. They then drop off after eight or nine days. 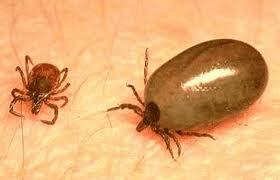 Only ticks that are attached and have finished feeding or are near the end of their meal can transmit Lyme disease. After arriving on the skin it usually takes the tick 24 hours before feeding begins. Note the difference in appearance between an engorged tick and an un-engorged one. Watch out for rashes as shown below, especially around the site of the bite. In the UK there is no need for any treatment unless symptoms develop. 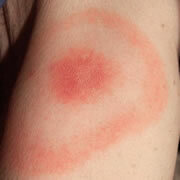 This rash occurs in 90 percent of symptomatic Lyme disease cases between 2-40 days after the bite. Classically it has a ‘bulls eye’ appearance as above but can be more of a red ‘patch’. 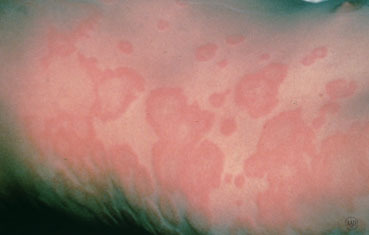 The rash can spread to form a circle up to 50cm across. Seven percent of people develop a febrile illness without a rash, rather like a flu-like illness. Fever is more common in children. Headache, and chills, tiredness and joint aches may last several weeks without treatment. 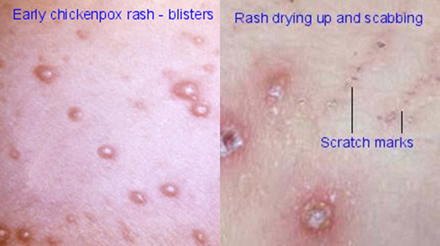 If you develop any rash or any of the above symptoms contact your doctor for a telephone consultation or an appointment as early treatment gives a very good outcome with cure in 95 percent of cases. Tiredness and headache are no more common at six months in those treated for early Lyme disease than in the general population. Blood tests are sometimes needed if the diagnosis is not clear. Warts are small, rough lumps on the skin that are benign (non-cancerous). They often appear on the hands and feet. Warts can look different depending on where they appear on the body and how thick the skin is. A wart on the sole of the foot is called a verruca. Warts are caused by infection with a virus. Most people will have warts at some time during their life. Most warts disappear on their own without treatment, although treatment may be recommended in cases where the wart is causing you pain or distress. Research has shown that, without treatment, 65-80 percent of cases of warts will clear up within two years. No single treatment for warts is 100 percent effective, and there is no guarantee that the warts will not return. Many treatments, such as creams, gels, paints and medicated plasters, are available over the counter from chemists. The active ingredient in most of these treatments is salicylic acid. In two-thirds of cases, research has shown that hand warts clear up within 12 weeks of treatment with salicylic acid. A very cold spray (dimethyl-ether/propane) is also available from pharmacies, which you can apply yourself. You should avoid using this spray on your face. Treatment with duct tape involves placing a piece of duct tape over your wart for about six days. If the tape falls off you simply replace it with a fresh piece. After six days, the tape is removed and the wart is soaked in water. After soaking the area in water, use an emery board to rub away any rough areas. The wart should be left uncovered overnight and a new piece of duct tape applied the following morning. This procedure is then repeated for a period of up to two months. Rashes are rarely urgent and almost never require an urgent call to your GP. 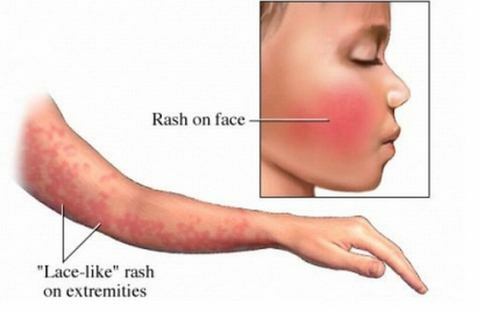 There are only two rashes that require immediate medical evaluation-these rashes are called petechiae or purpura. Petechiae appear as tiny red, pinpoint, flat spots. They look as if someone used a fine tip red ink pen to put little dots on the skin. Purpura are similar but larger and can be more purple or blue in colour. They do not blanch when you press on them. The way to check this is by doing the ‘tumbler test’. 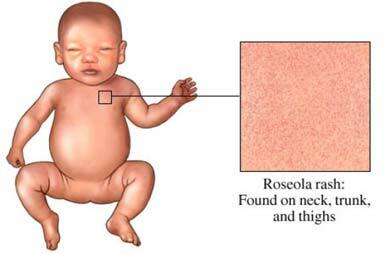 This is where you roll glass tumbler over the rash and if it disappears, it is not a petechia or purpura. If you can still see the rash through the glass this is when to seek urgent medical advice. You need to check the whole body for a rash. When should you see the doctor about other rashes? If your child is well and the rash does not bother them then you do not need to get it checked. A lot of rashes can stay around for weeks and will eventually go on their own. You should see your doctor if it has been there for more than four weeks. Your chemist may be able to advise you about over the counter treatments for certain rashes.